An Enerpac EVO synchronous lifting system is providing a helping hand to the largest tunnel boring machine ever deployed in the Southern Hemisphere. Advanced Enerpac synchronous hydraulic technology is being employed to tilt, push and turn the 3600-ton tunnel borer named Alice. The 100-metre long Earth Pressure Balance Machine will use its 14.5m diameter cutting head to chew through more than 800,000 cubic metres of subsurface rock involved in the Waterview Connection motorway project in Auckland, New Zealand, one of the most important infrastructure developments ever to take place in the country. The $NZ1.4 billion ($US1.14 b/ $A 1.29 b) project will complete a motorway ring route around the city by 2017, combating regional congestion and creating a direct, time-saving link between the International Airport and Central Business District (CBD). The New Zealand Transport Agency has appointed a specialist team, known as the Well-Connected Alliance to manage its design, construction, and operation. Comprising of NZTA, Fletcher Construction, McConnell Dowell Constructors, Parsons Brinckerhoff, Beca Infrastructure, Tonkin and Taylor, and Japanese construction company Obayashi Corporation, the Well-Connected Alliance brings together the knowledge and strong, home-grown reputation of leading New Zealand engineering companies including the Integrated Solutions operation of the global Enerpac organisation and Enerpac’s Australasian partners, Smith Cranes and sister company Universal Cranes. A new generation Enerpac EVO synchronous lifting system that replaces manual control of hydraulic heavy lifting with PLC control of multiple cylinder lifts has been employed for the application. With synchronous lifting, one operator controls the entire precision lowering, positioning and pushing process, during which the status of every cylinder is constantly monitored and displayed at a central control point. 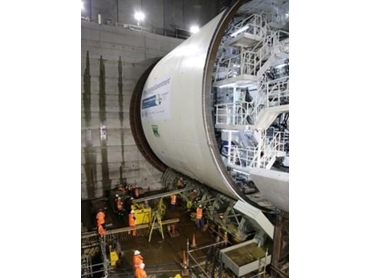 EVO technology involves a 12-point system on the Waterview Connection project, controlling ten 600 ton cylinders with internal stroke sensors to lower and tilt downwards the tunnel boring machine so as to deliver her into position to start cutting into the rock. Once positioned, the synchronous system pushes Alice a few metres forward to gain purchase and start tunnelling. Once a length of tunnel is completed, the same synchronous system is redeployed to tilt and turn Alice around to complete the other parallel length of the dual carriageway, eventually arriving at the starting point. Mr Richard Verhoeff, Australasian Integrated Solutions Manager for Enerpac explains that the EVO system uses digitally controlled hydraulics to accurately and safely lift, shift and balance some of the largest and most challenging structures on earth, delivering accuracy, safety and productivity benefits for precision lifting of heavy infrastructure and resources industry machinery. Enerpac has operated throughout Australasia for more than 50 years and Enerpac’s synchronous system has already been widely employed in the Asia-Pacific for tasks as diverse as splitting mining draglines and hoisting ball mills and generators, through to launching marine structures. Enerpac is an international market leader in high pressure hydraulics, with 28 offices in 22 different countries and more than 1,000 employees and a strongly established distribution and service network throughout SE Asia. According to Mr Verhoeff, precision and safety apart, synchronous lifting ensures time savings of even up to 60% as the process does not have to be stopped after any incremental value, checked, manually re-measured and corrected. The EVO system carries out these actions during the entire lifting process, even with low lifting or lowering speeds. For instance, in the Waterview Connection project, the team managed to complete the lifting and lowering process in one night, instead of the planned three days allowed for it. The versatility of Enerpac’s family of synchronous systems is further illustrated by the fact that a crane-borne version of the technology, called SyncHoist, was used earlier to position the Tunnel Boring Machine (TBM) parts while the custom-designed machine was being assembled.